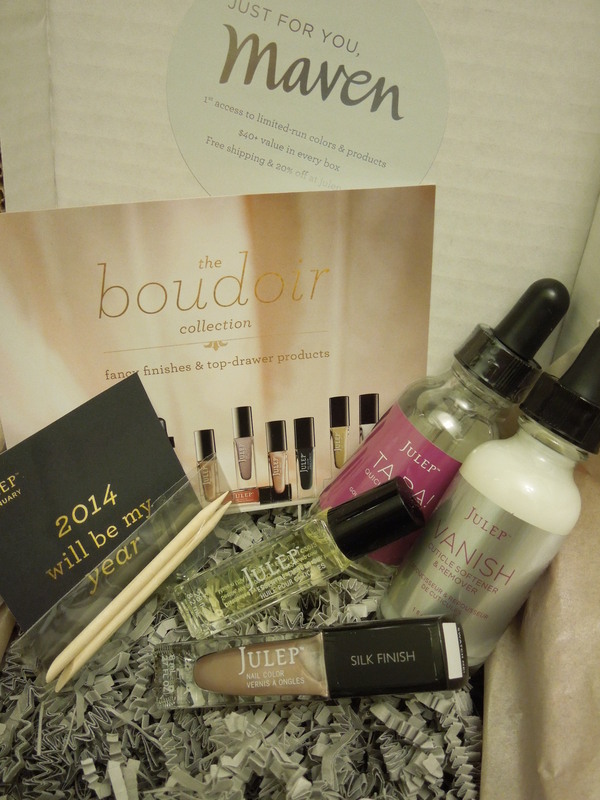 Julep’s January maven boxes introduced their new “Boudoir Collection” featuring lots of soft shades, and silk and satin finishes. 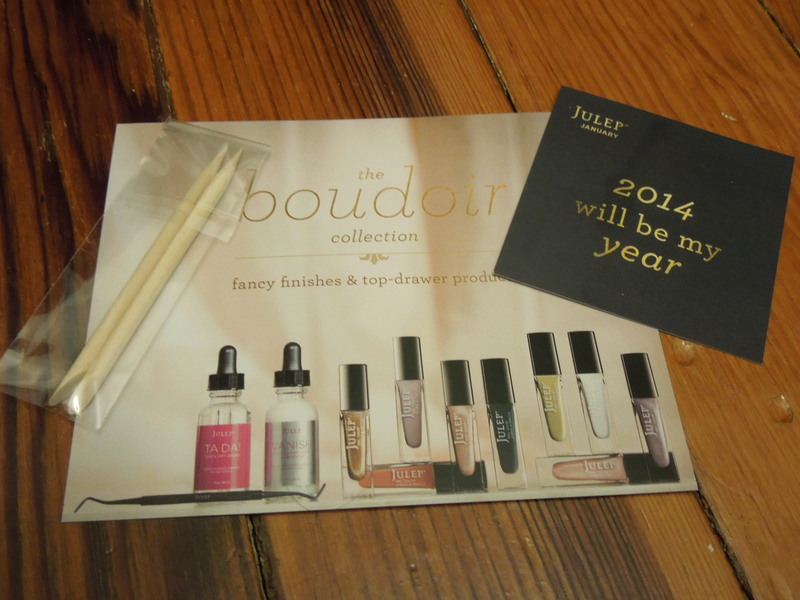 If you want more info on Julep’s maven subscription service and a coupon code, skip down below. Now let’s get to the box. 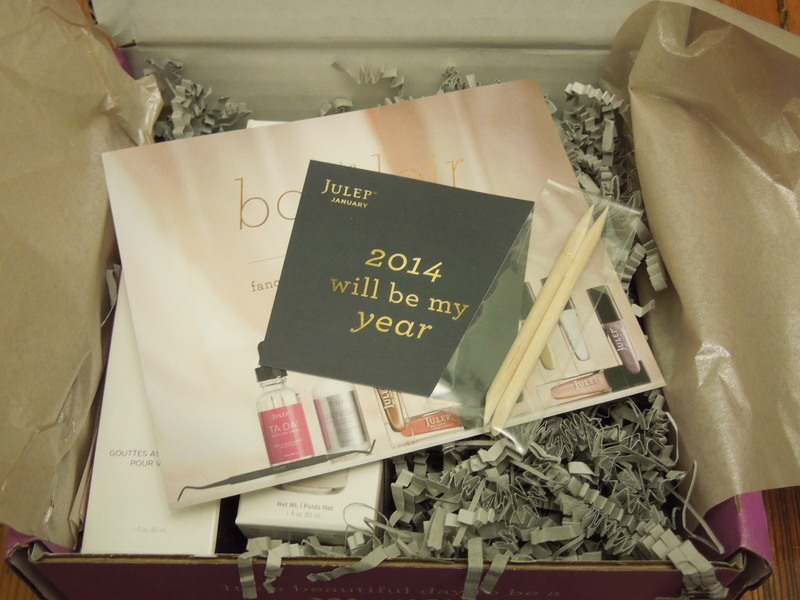 I’m not a pale neutrally sort, so this month I opted for the “Modern Beauty” box which only contains beauty products. Since I cannot resist new finishes so I added on one “silk” polish. Typically the Modern beauty box features only two full size beauty products, but this month we got three. This was the featured beauty product included in all the maven boxes this month. The surprise is that it’s not new, (although this may be a new formula.) 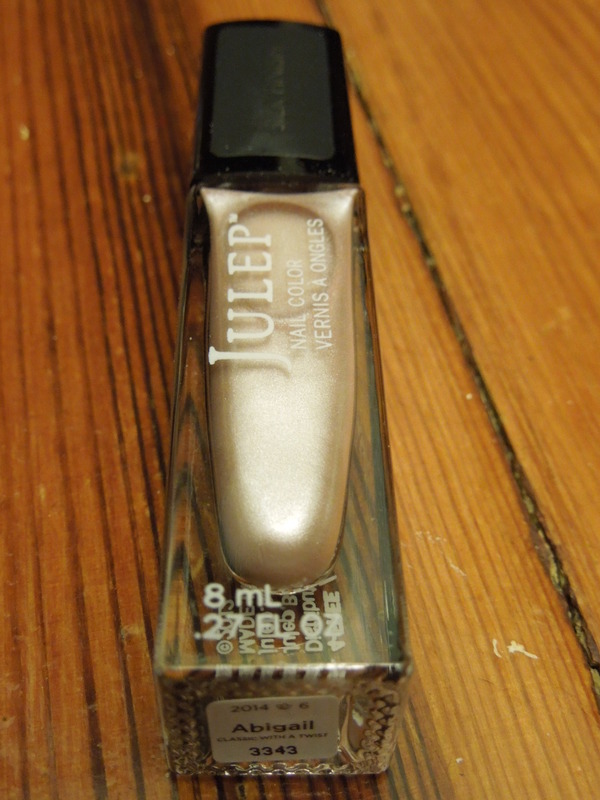 I actually purchased this in a Julep set long before I was a maven, so this was my first non-polish item from the brand. 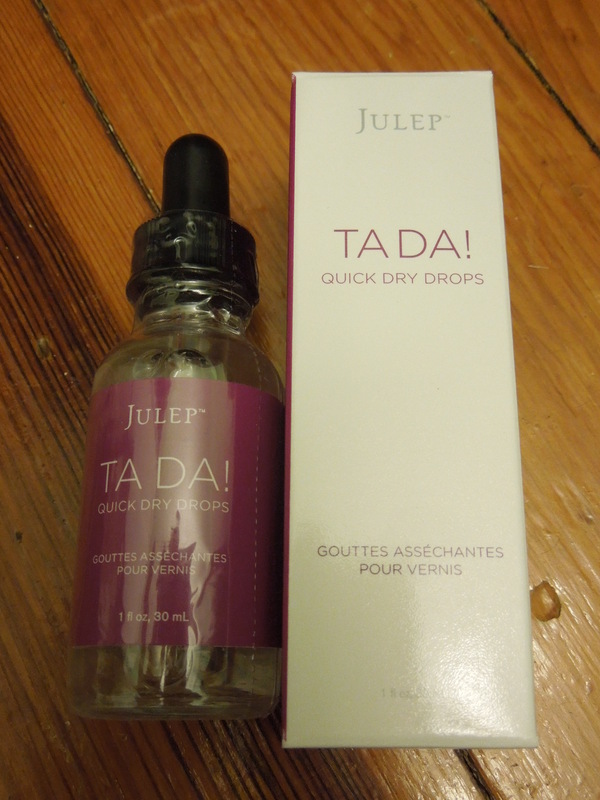 I found the drops to be effective as a quick dry solution and while the smell is strong (very herbal) it is not at all chemically (which is an issue I had with other quick dry products). Unfortunately, the product had a few other problems. The liquid seems to evaporate quickly (even in unopened bottles) and over time it gets a yellow tinge. Hopefully this incarnation has fixed those issues, but even with those drawbacks it is still a solid product. This was the beauty product everyone was buzzing about and there was some disappointment that it wasn’t the featured beauty pick that went in all the boxes. According to Julep, “Used in over 250,000 Julep Nail Parlor manis, this…conditioning formula quickly removes overgrown cuticles, clearing the way for a cleaner, prettier mani (or pedi). 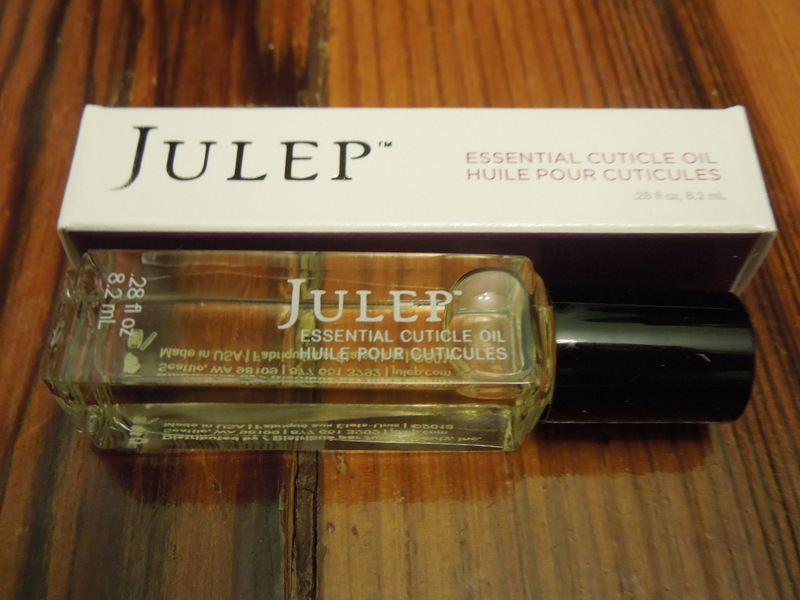 Over time, you’ll notice a dramatic decrease in cuticle regrowth.” Now I normally don’t mess with my cuticles much and they aren’t too much of a problem for me, but I was really intrigued by this product and can’t wait to try it out. I feel like this product is perfect for the time of year. Thanks to the polar vortex it’s been so damn cold and I’ve been pretty much dipping every body part that gets exposed into some kind of oil. I love the rollerball applicator and the Vitamin E. I feel like it really helps my poor winter abused cuticles. Another month and another polish that I chose for sentimental reasons. (Who would think polish could tug at the heartstrings?) My niece’s name is Abigail (although she is an “Abby”). She loves pink and fashion and nail polish and art and all things girly and fun. I wanted to try out the silk finish and I think this shade of pink will work great with a wide variety of topcoats. 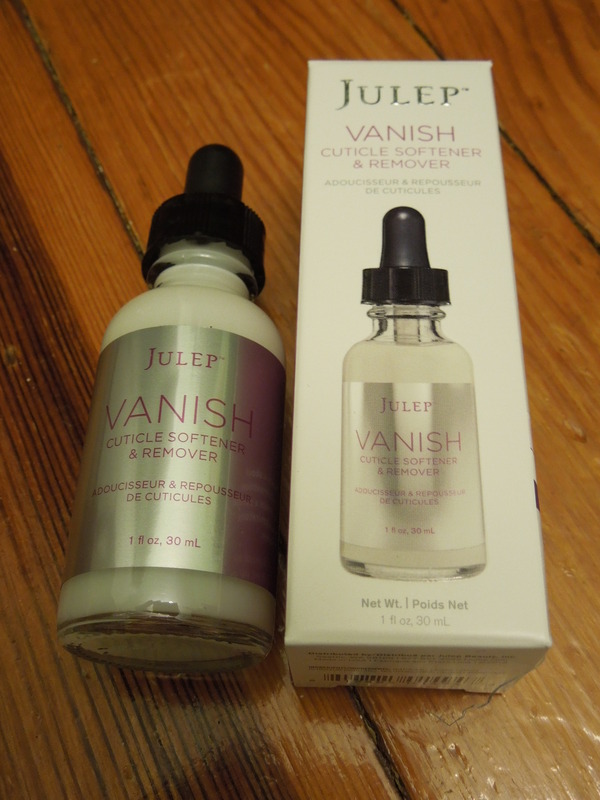 (I can’t wait to try it out with Julep’s Max). It’s not the most exciting shade, but it’s another solid, practical addition to my collection. Orange Sticks are always useful so definitely a worthwhile surprise. The retail value of my items was $64.00 and the maven value was $51.20. With all my products and tax I only paid $26.73. Ironically “the boudoir collection” was probably my least exciting Julep box, yet my most practical. This was chock full of manicure staples that I will use over and over again. The Abigail polish is a lovely neutral that I can wear alone for an understated look or dressed up with lots of fun topcoats. So maybe my choices were more flannel pajamas than lacey negligee, but I’m really happy with my maven selection this month. The polish is a really pretty silky pink (kind of almost like pink champagne). I think it would look great on a lot of skin tones. Thanks for reading!